A towering Falcon 9 rocket sporting engine and computer upgrades successfully delivered a cache of research payloads to orbit Sunday, christening a new launch pad on California's picturesque coastline and opening the spigot for a torrent of launches in the company's $3 billion backlog. The 224-foot-tall launcher lit its nine Merlin 1D engines and made a leisurely ascent into a deep blue autumn sky over Vandenberg Air Force Base in California, blowing through the speed of sound in 70 seconds and sending a crackling roar reverberating through the seaside hills. The Merlin 1D engines generated 1.3 million pounds of thrust at sea level, powering the launcher into the upper reaches of the atmosphere within three minutes, then letting to and allowing the Falcon 9's single-engine second stage to do its job. Nine minutes after liftoff, the upper stage's vacuum-optimized Merlin engine - glowing red hot from its fiery exhaust - shut down after reaching orbit. All of the mission's passengers, including Canada's Cassiope space weather research satellite and student-built secondary payloads sponsored by the U.S. Air Force, deployed from the second stage as planned. The rocket's largest satellite, the 1,100-pound Cassiope spacecraft, called its operations team at MDA Corp. in British Columbia via a ground station in Antarctica, confirming its health and orbit. "It was a great day, and we accomplished all of our primary mission objectives," said Elon Musk, SpaceX's CEO. The rocket demonstrated new Merlin 1D engines - more powerful than SpaceX's earlier engines - a simplified stage separation system, a triply redundant computer, and a 17-foot-diameter payload fairing. All told, the upgrades boost the Falcon 9's lift capacity by about 80 percent, according to Musk. Our launch preview story provides more details on the upgraded Falcon 9. But the mission did not achieve two goals. Musk described them as "optional" objectives. SpaceX ultimately hopes to reuse Falcon 9 first stages, and the company programmed the first stage Sunday to reignite two times after separating from the rocket's upper stage. Musk said the first restart of the first stage engines went well to guide the rocket back into the lower atmosphere, but a second ignition was cut short because the rocket was put in a spin, with the centrifugal force driving the stage's leftover liquid oxygen and kerosene propellants away from fuel lines and causing a premature shutdown. 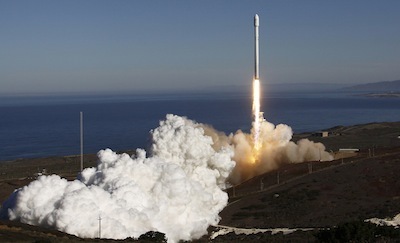 And SpaceX planned to demonstrate the ability of the rocket's upper stage to reignite in space, a feature critical to the company's future missions to higher orbits, including the next Falcon 9 launch scheduled for late October from Cape Canaveral, Fla., with the SES 8 communications satellite. Musk said engineers think they understand the problem and it should be fixed in time for the the SES 8 launch. SpaceX stressed Sunday's launch achieved its main goals - proving the upgraded Falcon 9 v1.1 launcher and deploying its payloads in the correct orbit. "It certainly is a huge relief to have successfully delivered Cassiope to orbit," Musk said. "It's been weighing on my mind quite heavily. The 1,100-pound, six-sided satellite was launched for MDA Corp., a Canadian aerospace contractor, but the mission is a partnership between MDA, the Canadian Space Agency, the University of Calgary, and the Canadian government's industrial development agency. Cassiope will sample the Earth's ionosphere, dipping through layers of the outermost layers of the atmosphere to gauge how it responds to solar activity. Research using Cassiope could help scientists understand how solar storms can impact everyday life by disrupting communications or knocking out electrical grids.